At Key Stage 5 our department offers two courses. 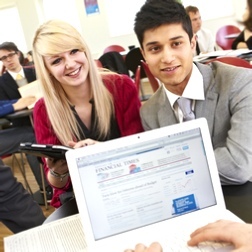 In Year 12, students can follow AQA A-level Economics and/or the AQA Applied General Certificate in Business. Paper 3: Economic principles and issues (30 objective test questions + extended written paper with questions for 10, 15 and 25 marks). Assessment is through a mixture of external examination (1/3) and the assembly of portfolio type evidence (2/3). Assessment is entirely through terminal written examinations, which take place at the end of Year 13. Students considering these courses must be genuinely interested in these subjects and be prepared to work hard both inside and outside of the classroom. A strength in both Maths and English Language will be helpful to students wishing to pursue these courses.